A, AB, O, A, A, O, O, AB, B, A, O, B, A, B, O. Represent this data in the form of a frequency distribution table. Which is the most common, and which is the rarest, blood group among these students? It can be observed that 9 students have their blood group as A, 6 as B, 3 as AB, and 12 as O. Therefore, the blood group of 30 students of the class can be represented as follows. it can be observed clearly that the most common blood group and the rarest blood group among these students is O and AB respectively as 12 (maximum number of students) have their blood group as O, and 3 (minimum number of students) have their blood group as AB. Construct a grouped frequency distribution table with class size 5 for thedata given above taking the first interval as 0 - 5 (5 not included). 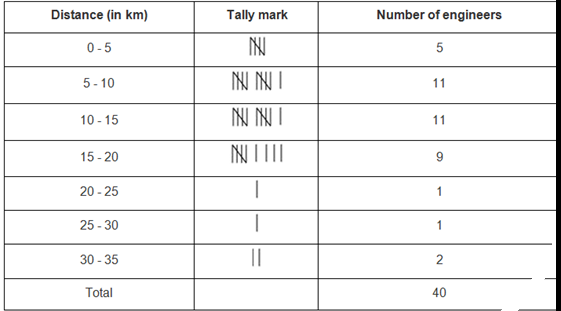 What main feature do you observe from this tabular representation? (i) Construct a grouped frequency distribution table with classes 84 - 86, 86 - 88, etc. (ii) Which month or season do you think this data is about? (iii) What is the range of this data? (ii) It can be observed that the relative humidity is high. Therefore, the data is about a month of rainy season. (i) Represent the data given above by a grouped frequency distribution table, taking the class intervals as 160 - 165, 165 - 170, etc. (ii) What can you conclude bout their heights from the table? (i) A grouped frequency distribution table has to be constructed taking class intervals 160 - 165, 165 - 170, etc. By observing the data given above, the required table can be constructed as follows. (ii) It can be concluded that more than 50% of the students are shorter than165 cm. (i) Make a grouped frequency distribution table for this data with classintervals as 0.00 - 0.04, 0.04 - 0.08, and so on. (ii) For how many days, was the concentration of sulphur dioxide more than 0.11 parts per million? Taking class intervals as 0.00, - 0.04, 0.04, - 0.08, and so on, a grouped frequency table can be constructed as follows. 0.12 - 0.16, 0.16 - 0.20, 0.20 - 0.24. (i) Make a frequency distribution of the digits from 0 to 9 after the decimal point. (ii) What are the most and the least frequently occurring digits? (ii) It can be observed from the above table that the least frequency is 2 of digit 0, and the maximum frequency is 8 of digit 3 and 9. Therefore, the most frequently occurring digits are 3 and 9 and the least frequently occurring digit is 0. (i) Make a grouped frequency distribution table for this data, taking class width 5 and one of the class intervals as 5 - 10. (i) Our class intervals will be 0 - 5, 5 - 10, 10 - 15….. The grouped frequency distribution table can be constructed as follows. (ii) The number of children who watched TV for 15 or more hours a week is 2 (i.e., the number of children in class interval 15 - 20). Construct a grouped frequency distribution table for this data, using class intervals of size 0.5 starting from the intervals 2 - 2.5. A grouped frequency table of class size 0.5 has to be constructed, starting from class interval 2 - 2.5. By observing the data given above, the required grouped frequency distribution table can be constructed as follows.